I've seen a few different luaus and the Old Lahaina Luau on Maui is far and away the best. The show I saw was on January 17, 2003, the 110th commemoration of the overthrow of Hawaii Queen Liliʻuokalani by US military forces. I had flown in that day from Honolulu, where Iolani Palace was all draped in black bunting. The show traced the history of the Polynesian people and the settlement of the various islands. It told the story of Pele, Goddess of Volcanoes, and brought it into modern times with the unification of the Hawaiian Islands by King Kamehameha the Great in 1810, to the overthrow of Liliʻuokalani in 1893. The Queen was a musician and composer and they performed some of her songs, including The Queen's Prayer, written while she was under house arrest in Iolani Palace, "He Mele Lāhui Hawaiʻi" ("The Song of the Hawaiian Nation"), and "Aloha ʻOe" (Farewell to Thee), Liliʻuokalani's most famous song and a common cultural symbol for Hawaii. The choreography, costumes, set, and music were absolutely spectacular and unique to this show at Old Lahaina Luau. PaulB's Pointillistic/Impressionist original oil paintings of Hawaii Hula and various prints and poster formats of a wide variety of subject matter by the Pointillistic/Impressionist oil painter from landscape/waterscape paintings, dance, sports, portrait, to classical figures, flowers, rock and roll, Brazil, and Hawaii Hula paintings and prints are available for purchase for as little as $49.95 for an 8" x 10" matted print on photo pape. 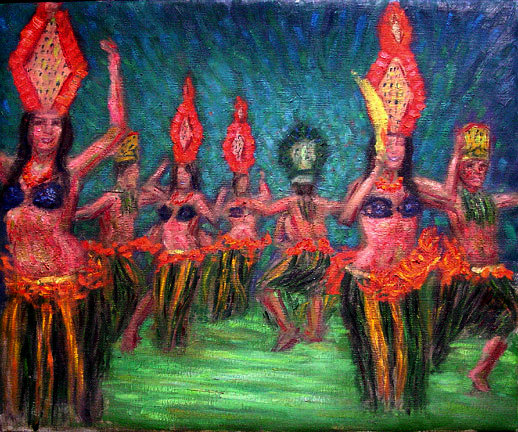 Pointillistic/Impressionist Giclee prints of Hawaii Hula on real canvas or heavy watercolor paper are available. One of a kind Hawaii Hula embellished prints, which are Giclee prints retouched in genuine oil paint by PaulB. Unless noted PaulB's original Pointillistic/Impressionist oil paintiings are oil on canvas. Paul Berenson's pointillistic/Impressionist oil paintings are in privale collections around the world, including the downtown Los Angeles Athletic Club and have appeared in numerous publications, including the New York Philharmonic Playbill. PaulB.com also builds websites and PaulB is a member of the LA Web Professionals Group.